Today I sat down with Sonnet, my needle and thread, some ribbon, and the Packer game. I had an attentive supervisor. I finished adding the ribbon and buttons before the end of the game. Go Packers! Great game, by the way. Since the DH was out trout fishing, I headed to the bathroom mirror. But then I remembered, I had a self timer! Yarn: Rowan Summer Tweed in Reed - 10 skeins. I have very little yarn left. Gauge of 3.5 stitches per inch. 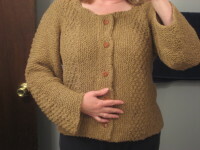 Modifications: I pulled up the neckline by an inch to be able to wear the sweater without another garment underneath. I also knit the sleeves from the cap down because I was running low on yarn. I added grosgrain ribbon under the button bands and around the neckline to stabilize the fabric. I'm very happy with the result. 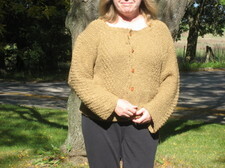 I enjoyed working with the Summer Tweed yarn; it provided exactly the texture I was hoping for in this sweater. 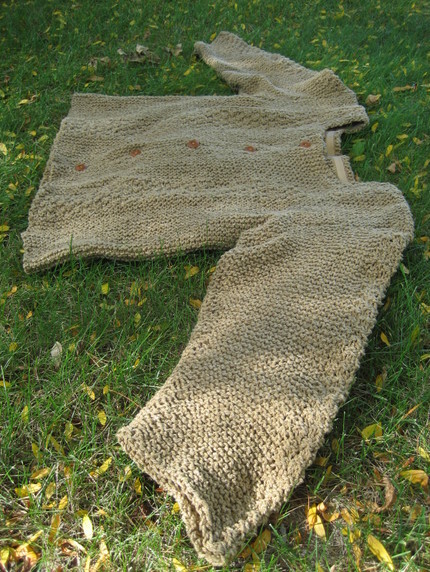 It is a great pattern and helped me understand more about sweater design and gauge. 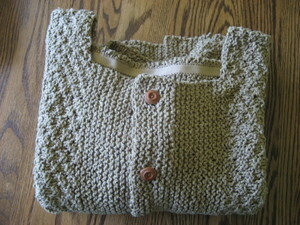 This sweater should expand my wardrobe for both work and play and I am pretty happy with the finished sweater. 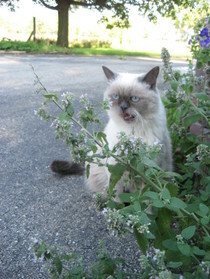 Garden news and a Sonnet update. I'm back on the road (again), on dial-up, but best of all, with DH for most of the work week. I have been working on the grossgrain ribbon reinforcement for Sonnet this evening to augment what I started on Sunday. 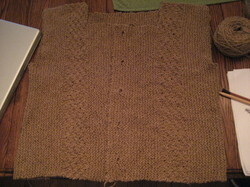 The neckline reinforcement is up for tomorrow evening and I hope to be courageous enough to add the buttons. So far, I really like the effect of the ribbon. It is kind of like boning in the bodice of a prom dress. You can't really see it but, gosh, does it do the job! *g* My hand-sewing isn't something I want to share with the blog world but perhaps some photos later this week of the finished sweater. (I am on dial-up until Friday, so I'll have to see how bad the upload time will be.) I also finished sewing my trousers yesterday! Hurray. It was a productive weekend. 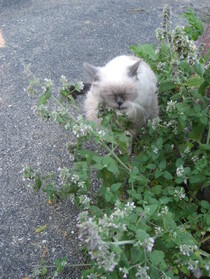 I'm growing catmint next to my herb garden and the cats seem to enjoy it. It is in bloom right now. 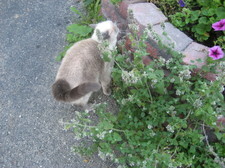 Here's a few photos of Blue and the catmint from this past weekend. I finished the second Sonnet sleeve this evening!! My knitting needles are bare. I even have yarn left to seam the shoulders and sleeves. Huzzah! 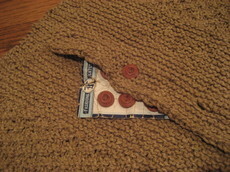 I found buttons in Grandma Nana's button collection and I think they work well for this sweater. I am really pleased with the sweater so far. Now, to put it together and brave the mirror! 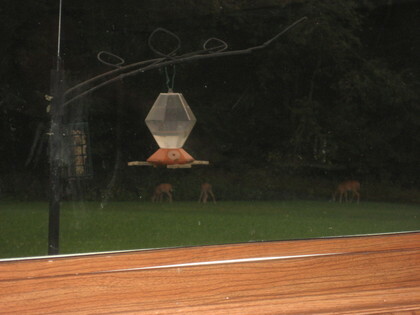 And if an almost finished sweater weren't enough, the deer family visited this evening. (Oh, for having the telephoto lens camera at hand for moments like these!) A whitetail doe and her twin fawns browsed in the backyard for about 20 minutes this evening. They finally saw me get up to set the table---well, we have to eat, too----and hopped into the woods for dessert. The postal person delivered a package today! My Bee Fields kit arrived from Wooly Wonka Fibers. The yarn is beeautiful! 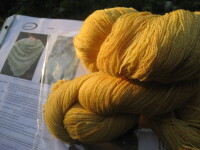 It is the Buckwheat Honey colorway. I could not resist the name. I've joined the Bee Fields KAL so I'll cast on soon. I purchased some Addi Lace circulars last Friday from a yarn shop in Neenah on my quick visit with my mom. I'm certain this shawl will be a learning experience project but I have to try because it is so lovely. 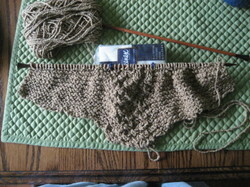 I've been knitting and working on the last sleeve for Sonnet...and I'm still not finished with it. Seems like I would have a sleeve the length of my leg by now, don't you think? Tonight I am going to try a recipe for Oatmeal Breakfast Bars. I've been leaving the house without breakfast for the past several workdays, and I don't like the way I feel. I'll give the review of the bars tomorrow. I would certainly be interested if anyone has a good breakfast bar recipe! Feel free to make suggestions. 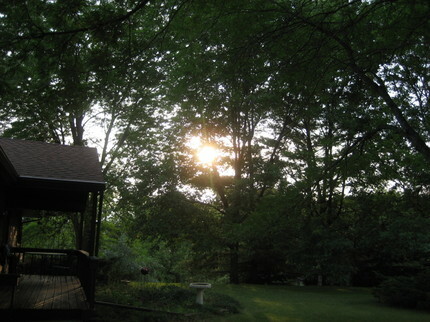 Here's the early almost sunset view from the front yard of Purling Oaks. Home sweet home. I just saw the funniest thing in the backyard while editing this post! A whitetail fawn was browsing in the yard and was playing with and actually chasing a rabbit! I did have my camera but the fawn was only a blur. It was a wet Saturday for most of the day even though we saw a bit of sunshine. The ground is pretty wet and DH is wondering if he'll be able to mow at all this weekend. The temperature is still really pleasant and we've been able to keep the windows open and enjoy the outside sounds of birds...lots of birds. I actually slept well last night. Hurray. The end of the yuck is near. Good thing. I'm flying east on Monday. 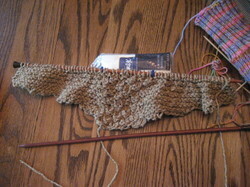 I knit some on Sonnet and here's my progress. 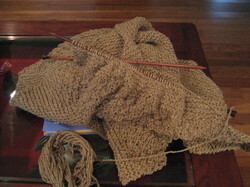 True, I'm not a speedy knitter but I am making some progress. This view is pre-coffee this morning. 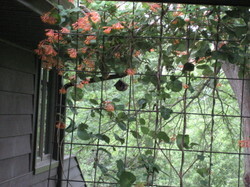 The honeysuckle is lovely this weekend. 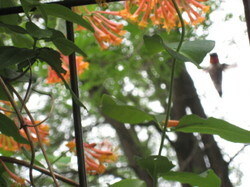 While I was taking photos, a hummingbird werrrrrrred in to sip some nectar. The image is a little fuzzy but it is the best of the ones I shot. The roses are starting to bloom. 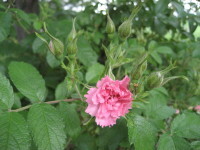 I have what I call shrub roses as well as tea roses. There's one miniature rose, too, unless the poor baby is really stunted. These roses came with the house and I'm doing my best not to kill them off. In the past I have not had the best track-record with keeping roses alive. *ahem* This summer starts the third full year of having responsibility for them. The good news is that they are all still alive and there are more blossoms this year than before. The bad news is that something has started eating the leaves again. I don't see any little crawlers but there has to be something there. I spray with a rose bug spray but last year several of the rose bushes looked pretty bad by July. Of course, part of my problem is that I'm not home everyday to police that garden. I'm open to any and all suggestions about what to do with the roses. Another travel afternoon! We made it to Milwaukee with no problem and time to spare (and knit) before our puddle-jumper left for Madison. Then we hear that the flight has been cancelled for lack of flight crew. Lack of flight crew? Where did they go?!!? Anyway, after a comedy of errors that Larry, Mo, and Curly would have been proud of.....we departed Milwaukee on a bus. By we, I mean me, DH, and all our various and sundry luggage. Cool. More knitting time. We made it home about an hour and a half late but we are home and pizza is just out of the oven. Life is good. 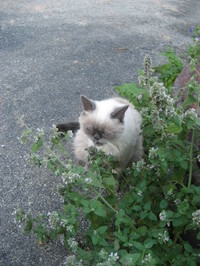 Soon after we arrived home, I made the rounds of the gardens. One geranium has fallen prey to Mr. Deer---dratted deer. In the vegetable garden, I found a few radishes that achieved edible status. So I did. Eat them, that is. 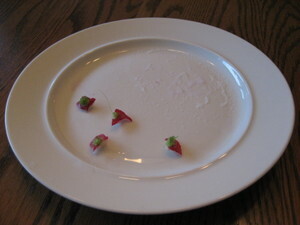 The first garden produce in my tummy. Sigh. I'm a happy gardener. And if freshly pulled and eaten radishes aren't the best remedy for what ails me, I don't know what else is. 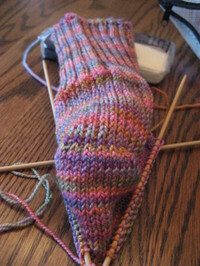 Today I finished the last two rows or so on the heel flap and I'm almost finished with the gusset. I am thinking about knitting the foot a bit longer for this sock and ripping the toe out of sock number one and extending the foot. 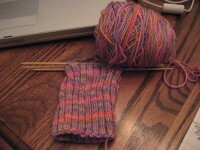 The first sock fits but length-wise is under maybe too much tension. I'm pleased with the progress so far and I plan to work on this project this weekend while I try to rest. Resting may be a challenge since I'm feeling good enough to see my long to-do list and think about my short weekend. DH will be reminding me to rest, I'm sure. Today has been a very low-key day. DH is under the weather and I'm recovering but with occasional set-backs. 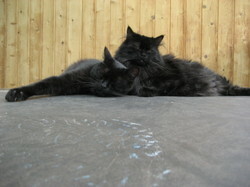 The cats have been in the same energy flow, as well. White Dot and Fuzzle rarely snuggle so this was definitely a moment to record. They were out on the sunporch during the rain showers when they decided to have a buddy-snooze. I've been relaxing and surfing today---reading blogs, looking at knit designers, and looking up trivia as I think of it. My knitting vocabulary has been expanded....I think I now know what a yarn cake is---I've been calling them yarn balls. Am I being gentrified? If I make a yarn cake, will my niece and nephews think I have an Easy Bake Oven? Probably not, they'll correctly think I'm just being silly. 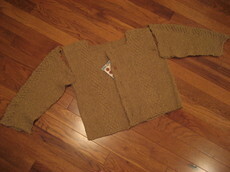 I viewed a lovely cardigan by Jean at Golden Purl. It is her first effort at designing her own sweater and I really enjoyed her description of the process she went through as she knit it. One of my other favorite designer blogs is Mind of Winter. Julia designs and knits items that are body-conscious but in a very nice way, and also writes pattern, book, and yarn reviews. I always leave her blog with something interesting to think about. I worked a bit more on Sonnet and if I get off the Internets, I should be finished with the main body and casting on for the sleeves before Memorial Day. It was a really beautiful weekend here. Blue sky, temperatures in the 70's, and just a bit breezy. On Saturday, besides doing laundry, I planted a few seeds. I planted peas, like Vicki, but later. *g* I also planted purple haze carrots, radishes, meslun mix, red leaf lettuce, and spinach. It will be interesting to see what comes up since I'm a bit of an absentee gardener and I have the challenge of local wildlife, and I don't mean the bar scene. Our state fair is a great state fair! Knitting content has been a bit low lately on this blog. But we'll see if this post will turn the corner for that topic. 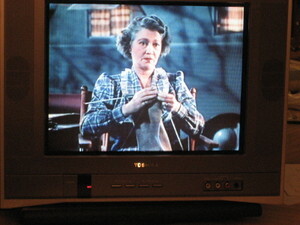 There was a knitting sighting this evening while we were watching the movie State Fair. The knitter was a "thrower" but I think she held her right needle over her hand and not in her palm. Interesting to watch...both the movie and the knitting. I've finished packing and all I need to do is relax and catch some quality sleep (sleep fast) before I head to the airport on my way to the Kansas City area. I'll be working near Independence, MO. Anyway, Sonnet will be set aside for a while (do I hear sarcastic laughter?) and I'm picking up the Sunrise Socks again. Since I have been doing more knit blog reading than knitting, I hope osmosis has occurred and I've picked up speed from reading Cookie and Norma and many others I'm just too tired to link to.